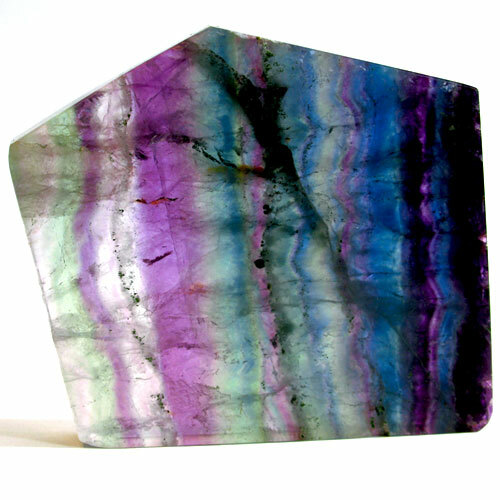 Fluorite often occurs in glassy bands found in a variety of mineral environments. Fluorite is commonly found in metallic hydrothermal deposits associated with lead, silver, galena, sphalerite, or cobalt deposits. Fluorite is often found in hydro-thermal deposits such as areas with hot springs, where porous limestone has been infused with aqueous fluoride. Fluorite is said by crystal healers to enhance our powers of discernment, and help us reach a balance in relationships. All colors of fluorite are effective for clearing the aura and energy centers and can facilitate a deep state of meditation although each has unique mineralogical and metaphysical properties. Read more about the many flavors of Fluorite in our Crystalpedia.